Bread has always been important to Greeks. For some Greeks bread is so important that no meal can be conceived without it. Bread making was passed on to Greece from the Egyptians and then the Greeks taught the Romans how to make bread. The Ancient Greeks considered bread making an early mark of civilization that lifted them above other people. The Romans were unfamiliar with bread until they met the Greeks. They favoured gruel (porridge). The Romans grew to love Greek bread so highly that almost all the bakers in the entire Roman Empire were Greeks. Spelt bread is one of the most Ancient Greek forms of bread making. Bread played a very important role in every day life in Ancient Greece. The flour was kneaded with water, or with water and honey, sometimes with oil or honey and wine (oinomelo). The breads varied in the manner of cooking as well as in shape. For visual effect bread was garnished by sprinkling sesame, poppy or flax seeds on top, as the Ancient Greeks first did around 600 BC. Bread in current times also has spiritual significance and is often referred to “Artos” and is used to celebrate religious occasions such as Christmas when Greeks make “Christopsomo” – Christ’s bread. A Greek dinner table would not be complete without bread. 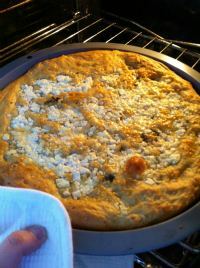 In a mix master bowl place the flour, yeast, salt, half of the olive oil, and half the cheeses. Using the dough hooks on low begin mixing the ingredients and add the water a little at a time. The dough is ready when the dough comes away from the sides of the bowl. Cover the dough with cling wrap and set aside in a warm spot for half an hour for it to rise slightly. In a large round non-stick baking tray pour the remainder of the olive oil and scatter half the thyme. Place the dough and push it down around the tray and spread it out around the tray. Using wet hands that have been placed under running water push the cheese down into the dough. Place the tiropsomo in the oven and bake for 35 minutes until the bread is crispy and golden brown on top. Serve Tiropsomo whilst still warm.